Though he didn’t have time to cover all 500 new features, the focus will certainly center around communication, applications, and the way we use mobile internet. Along with the current service offerings in People Hub such as Facebook, Hotmail, and Gmail, Microsoft has gone ahead and added LinkedIn and Twitter. Mango will also bring with it a Groups feature, allowing multiple people to communicate across a multiple platforms, while simultaneously integrating those people’s profiles, pictures, and a group history of all events and communication shared. Instead of only being able to communicate with groups that all share the same hardware maker, Mango employs Windows Live Messenger and Facebook Chat to keep you connected with friends, including those with other phones. Another communication upgrade is an adjustment to call history, which integrates voicemail, missed calls, text messages, and any calendar events with regards to that particular contact. Speech-to-text will also offer a completely hands-free experience for texting, which was definitely impressive in the demo. Mango also upgrades all the different Windows Phone Hubs, most significantly Pictures, Office, and Xbox Live. Mango offers what Microsoft has dubbed people-centric pictures, which employs facial recognition software to quickly tag and share with friends straight from the Pictures app. The Office experience has also undergone a bit of a revamp. 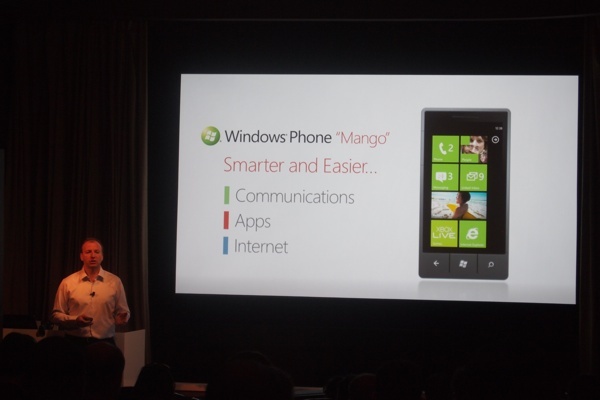 Mango will support Office 365 along with SkyDrive (which offers users 25GB of free storage). Office in Mango brings just about identical functionality to mobile, allowing users to highlight and arrange Excel cells or make changes to a Word document and save without worrying about any garbled information. Xbox Live Hub basically brings all of your gaming app experiences into one place in Mango, offering the friends scores, integrating a cute little avatar, and offering a quick-resume experience during multitasking. 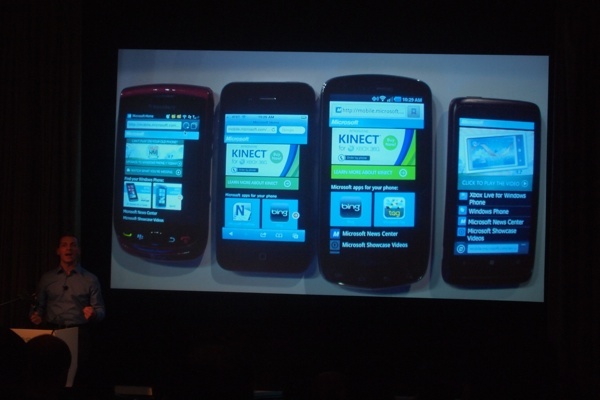 Finally, Mango will include and use Internet Explorer 9, which uses hardware acceleration and supports HTML5 to deliver a quick experience. When tested against the iPhone 4, the BlackBerry Torch, and the Samsung Droid Charge, the Windows Phone running Mango blew the other browsers out of the water, delivering 27 frames per second compared to BlackBerry’s 4 fps and Android’s 10 fps. The iPhone 4 couldn’t get started. Bing is also very deeply integrated into the browsing experience. An information search will bring up a Quick Card for a particular movie, event, place, business. Quick Cards offer all the possible information you could want including upcoming events, or other nearby restaurants in the neighborhood. Speaking of neighborhood, Mango also offers a feature called Local Scout, which organizes places by category for each individual neighborhood. 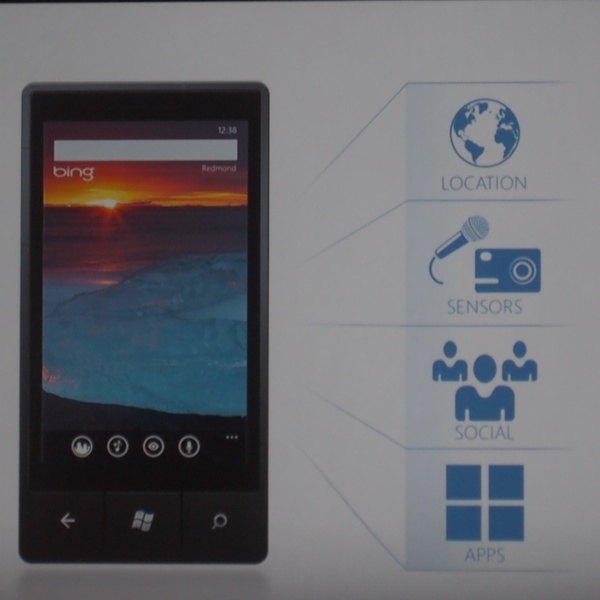 Also, if you’ve enjoyed Bing Voice, Mango will be a real treat as Windows Phone 7.1 will bring with it Bing Vision. With Bing Vision, you can simply snap a picture of a QR code, a 2D bar code, or even a book cover to bring up a Quick Card for that product. Mango will hit users in the Fall, according to Mr. Lees, but developers can get their hands on the SDK now.